New laws, after-school programs, mentoring and safe storage. 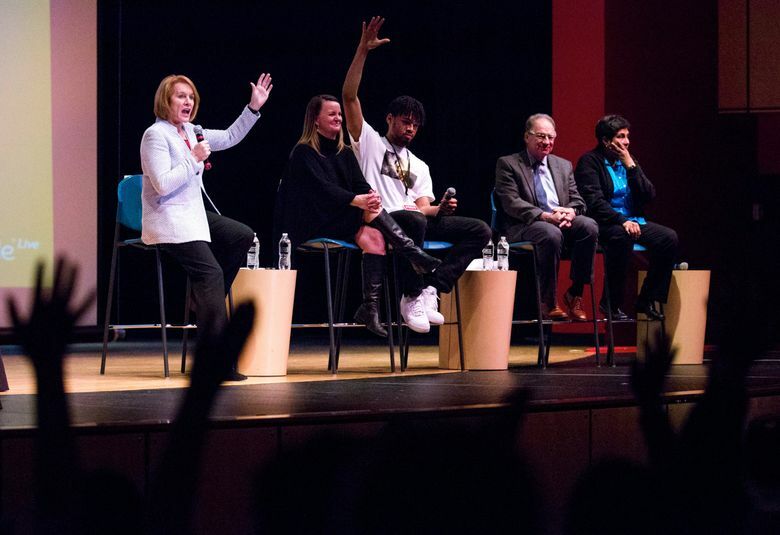 Those were some of the ideas discussed as Seattle Mayor Jenny Durkan joined a panel of speakers Thursday evening for a town-hall meeting on stopping gun violence. Speaking to students, parents and teachers in the Chief Sealth High School auditorium and to people watching online, Durkan said she intends to empower community organizations as the city seeks to curb shootings in neighborhoods and in schools. “We know what works. We just haven’t done it on a consistent basis,” she said, calling for neighborhood-based initiatives and an assault-weapons ban. Nyla Fritz, principal at Einstein Middle School in Shoreline, said her brother was killed in a school shooting years ago. She apologized to the teenagers in the crowd. “I’m sorry that adults have failed you,” by not passing laws that could restrict access to guns, Fritz said, thanking students who are advocating for such laws. Young people turn to guns when they lack programs that enrich their lives, meals that keep them focused and jobs that help them make ends meet, said Gregory Pleasant, 17, a Rainier Beach High student. “Resources need to be pumped into these communities,” Pleasant said. Last month in South Park, gun violence took the life of 16-year-old Dallas Esparza, said Carmen Martinez, a community leader. Children must receive support early, before they reach high school, she said. “When kids have a reliable mentor … it’ll help them move away from taking action,” Martinez said, describing gangs as a concern. The panel mostly focused on gun assaults, but 75 percent of gun deaths in Washington state are suicides, said Dr. Fred Rivara of the Harborview Injury Prevention and Research Center, emphasizing the need to store firearms safely. Journalists from KING-TV and KUOW moderated the meeting, taking questions from the crowd and online.